Prepare Your PR Card Replacement Online! Prepare and complete your application for PR Card replacement today! Complete your application quickly and correctly with our step-by-step guidance that leads you through each question. Who is Eligible for a PR Card Replacement? a PR Card replacement of a lost, stolen or damaged card. should not be convicted of an offense related to the misuse of a Permanent Resident Card. The application process for a PR Card replacement for Canada requires individuals to file form IMM 5444 and submit the required documents in order to replace a lost or stolen card. Lost, stolen, destroyed or expired immigration documents issued by the government of Canada can be replaced. To have PR Card replaced, individuals must complete an application and pay the applicable processing fee. If your Permanent Resident Card is lost, stolen or destroyed, immediately contact the IRCC (formerly known as CIC). 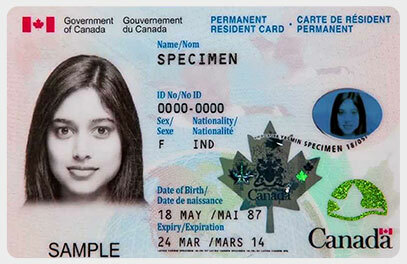 Your original Permanent Resident Card (if it is damaged). Please note that if photocopies are not clear, your application will be returned to you. Photos. Consult the Photo Specifications Appendix in the guide for more information. If your photos do not meet the requirements, they will not be accepted. Any other identity documents specified in the Document Checklist (which will be part of the application kit). Remember to include the Supplementary Identification Form (IMM 5455). What Are the Steps in the PR Card Replacement Process? Complete your application quickly and correctly with our step-by-step guidance that leads you through each question or download and complete blank forms available directly form the IRCC (formerly known as the CIC). Pay he government filing fee online. The fee paid to the Government of Canada is separate from the fee paid to Immigration Direct. Upon approval of your application aPR Card will be sent to you.